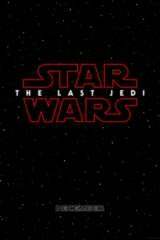 Star Wars: The Last Jedi - What Does The Red Logo Mean? The title for Star Wars: Episode VIII is finally here, and with a name like "The Last Jedi" it's going to get fans talking. But aside from the title, which leaves plenty of obvious and subtle options for to whom it's referring, the logo itself is also intriguing. With the words Star Wars in red on the poster, the reveal could be teasing something huge, namely, the death of a Jedi. NEXT: Star Wars Episode VIII: Who Is The Last Jedi? The other two Star Wars movies that have used red logos in the past are the final movies of their respective trilogies: Star Wars: Episode VI - Return of the Jedi and Star Wars: Episode III - Revenge of the Sith. The whole feeling of finality to "The Last Jedi" is intriguing, being the middle chapter. But aside from those being their respective last chapters, they also both contain major deaths. Oddly - there's one character that dies in both of those movies: Anakin Skywalker. In Sith, Anakin "dies" in the sense that his identity is completely changed when he gives himself over to the dark side and becomes Darth Vader. In Jedi, after Anakin returns to the light, he dies in a literal sense. Sith also saw the death of Padme, naturally, along with nearly all the Jedi. Jedi gave us Yoda's final moments, too. In other words, someone is going to die in Star Wars: The Last Jedi, and it's going to be someone important. The easy money would be on Luke Skywalker becoming one with the Force this time around. He is the titular Last Jedi, in at least one sense of the phrase, and his death would mean the death of the Jedi as we know them. It could open things up for Rey to become something new, or step into a new revival of the Jedi as a whole, as well. Time will tell, but with the finality of the title and the red logo, it sure seems like something bad is coming for Luke Skywalker. Star Wars: Episode VIII, from writer/director Rian Johnson, is in post-production now for a December 15, 2017 release. The film follows-up and continues the story of the next generation of the saga as Rey, Poe, Finn, and Kylo Ren find their place in the galaxy and follow the legacy of Luke Skywalker, Leia, and Han Solo. Daisy Ridley returns to star as Rey, with other returning stars John Boyega, Oscar Isaac, Adam Driver, Domhnall Gleeson, Gwendoline Christie, Peter Mayhew, Andy Serkis, Anthony Daniels, Lupita Nyong'o Mark Hamill, and Carrie Fisher as General Leia Organa. Benicio Del Toro and Laura Dern join the cast in as-yet-unrevealed roles.